Joey Giardello scored a first round knockout over the usually tough Tony Baldoni, on this day in 1956. The bout was staged at the famous New York fight club St. Nicholas Arena. It was a hot summer night - the papers said more than 100 degrees under the ring lights. But the heat seemed to help Giardello, who came out loose and aggressive in the nationally televised fight. Pouncing like a hungry lion, Giardello landed a left hook and straight right combination that flattened the Wilkes-Barre, PA boxer for the full ten-count. Referee Ray Miller did the counting, and reached the limit of ten at 2:46 of the first round. 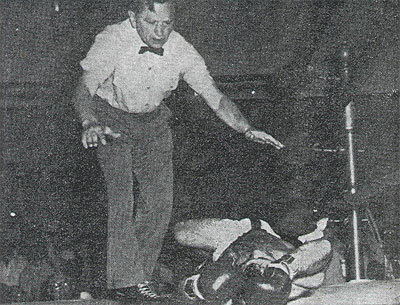 It took several minutes before Baldoni could get up and leave the ring unassisted. Giardello was not known as a big puncher - just 33 KOs in his 101 wins - but this first round job was the 11th opening round knockout he registered in his long ring campaign (one more quickie would come later in his career). Not bad for a light puncher. Coming off two consecutive decision losses to Charlie Cotton, the victory against Baldoni pushed Joey's record to 65-14-5 and began a 17-bout unbeaten streak that included two revenge wins over Cotton. Baldoni fell to 20-7-1. It was the third time he lost by the short route, but those who managed to stop him were all top-notchers - Harold Green (TKO5), Ralph 'Tiger' Jones (KO6), and Giardello. Baldoni fought into 1960 but finally call it quits after losing to the great Sugar Ray Robinson in the first round of their bout.